“Healing with Horses” is an inspiring new collection of true stories about the extraordinary connection between horses and humans. Readers will step into and delight in the healing world of horses through the heart-warming personal accounts found in this enriching book published by Big Country Publishing, an international multi-media publisher. Wendy Golding and Andre Leclipteux of Tottenham, Ontario are two of ten Canadian authors who expanded on their experiences and viewpoints explaining how horse interactions can be immensely therapeutic physically, emotionally, mentally and spiritually. The book reveals how horse healing touches the deepest part of the human heart and soul, reawakening our belief in magic, dreams and possibilities. Stories featured in Healing with Horses explain how our horse companions act as mirrors for our feelings, reflecting our feelings back to us. In doing so, they help us find the way to fulfilling lives – speaking our own personal truth, developing confidence, finding connection and meaning, and opening the doorway to deeper creativity. The authors share their stories to inspire the reader to explore their own ‘calling of the heart’ for freedom and connection. Beautifully told and profoundly moving, these stories of self-discovery through the way of the horse show the reader the way to authenticity and heart led lives. 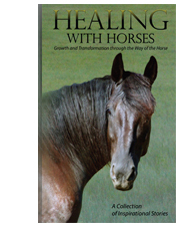 Healing with Horses is available in book and eBook formats at: Amazon.com, Amazon.ca, and Barnes and Noble. It is an amazing honour to be included in this book with nine other visionaries from the horse world. The authors come from a variety of horse backgrounds however we embody a common theme – experiencing first hand how these magnificent animals raise our consciousness and peel back the layers to uncover our true selves. Use secure PayPal checkout by clicking on ‘Buy Now’.